ESO’s Very Large Telescope Interferometer has revealed the largest yellow star — and one of the ten largest stars found so far. 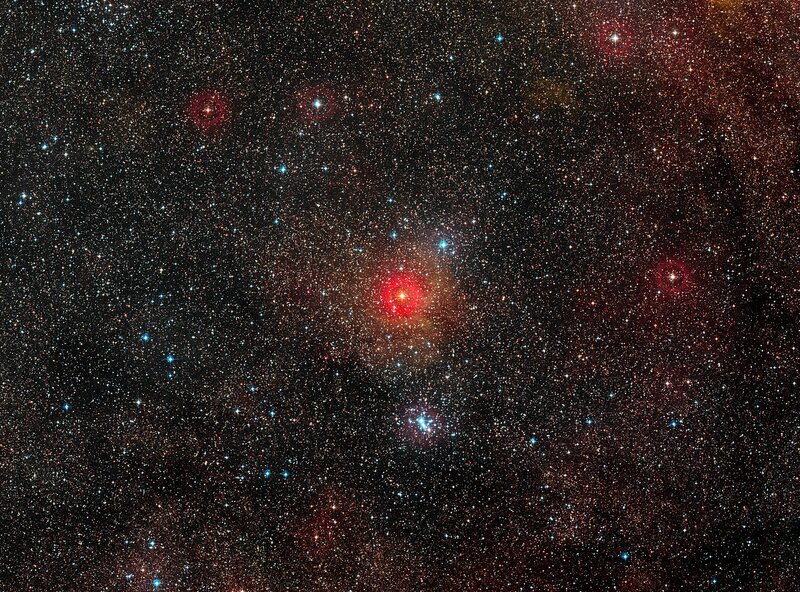 This hypergiant has been found to measure more than 1300 times the diameter of the Sun, and to be part of a double star system, with the second component so close that it is in contact with the main star. Observations spanning over sixty years, some from amateur observers, also indicate that this rare and remarkable object is changing very rapidly and has been caught during a very brief phase of its life. Using ESO’s Very Large Telescope Interferometer (VLTI), Olivier Chesneau (Observatoire de la Côte d’Azur, Nice, France) and an international team of collaborators have found that the yellow hypergiant star HR 5171 A  is absolutely huge — 1300 times the diameter of the Sun and much bigger than was expected . This makes it the largest yellow star known. It is also in the top ten of the largest stars known — 50% larger than the famous red supergiant Betelgeuse — and about one million times brighter than the Sun. The astronomers made use of a technique called interferometry to combine the light collected from multiple individual telescopes, effectively creating a giant telescope up to 140 metres in size. The new results prompted the team to thoroughly investigate older observations of the star spanning more than sixty years, to see how it had behaved in the past . Yellow hypergiants are very rare, with only a dozen or so known in our galaxy — the best-known example being Rho Cassiopeiae. They are among the biggest and brightest stars known and are at a stage of their lives when they are unstable and changing rapidly. Due to this instability, yellow hypergiants also expel material outwards, forming a large, extended atmosphere around the star. Despite its great distance of nearly 12 000 light-years from Earth, the object can just about be seen with the naked eye  by the keen-sighted. HR 5171 A has been found to be getting bigger over the last 40 years, cooling as it grows, and its evolution has now been caught in action. Only a few stars are caught in this very brief phase, where they undergo a dramatic change in temperature as they rapidly evolve. By analysing data on the star’s varying brightness, using observations from other observatories, the astronomers confirmed the object to be an eclipsing binary system where the smaller component passes in front and behind the larger one as it orbits. 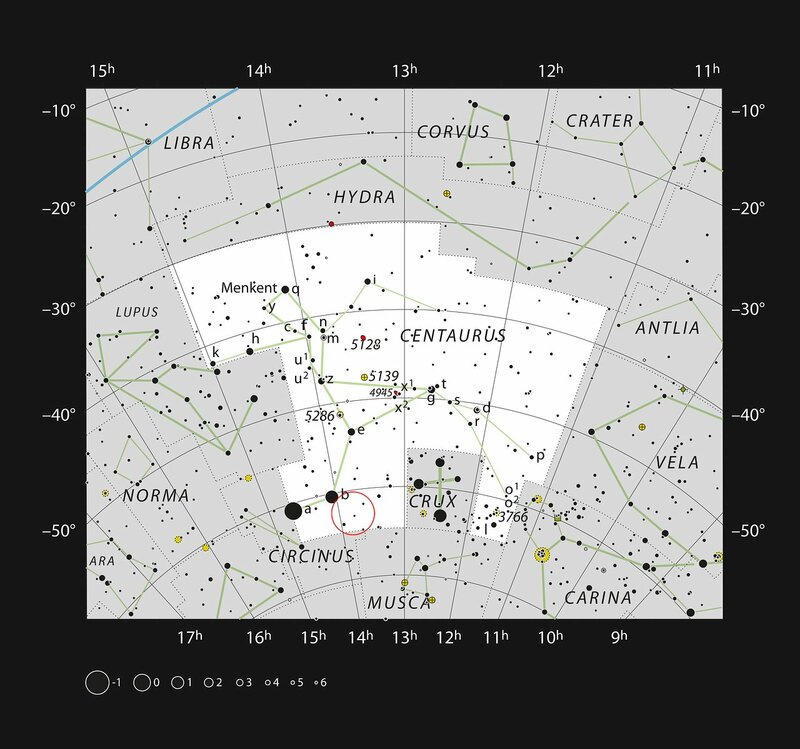 In this case HR 5171 A is orbited by its companion star every 1300 days. The smaller companion is only slightly hotter than HR 5171 A’s surface temperature of 5000 degrees Celsius. 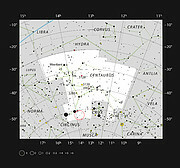 The star is also known as V766 Cen, HD 119796 and HIP 67261. Comparable objects seem to all be red supergiants which reach 1000–1500 times the radius of the Sun and have initial masses not exceeding 20–25 Solar masses. 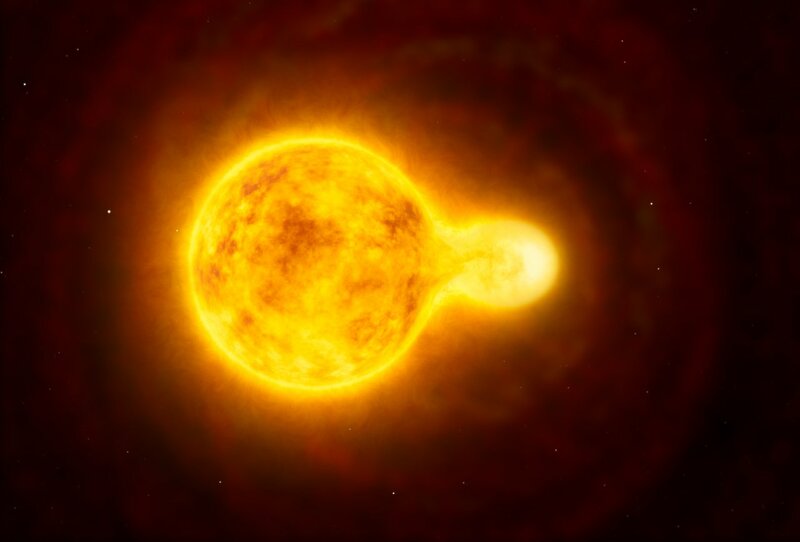 The radius of a yellow supergiant was expected to be 400–700 times that of the Sun. Spectral data were obtained using the Anglo–Australian Telescope with the University College London Echelle Spectrograph (UCLES), at the South African Astronomical Observatory (SAAO), with PUCHEROS, from the Pontificia Universidad de Chile (PUC) and through coronagraphic observations with the Near-Infrared Coronagraphic Imager (NICI) on the Gemini South telescope. Archival photometric datasets examined include infrared photometry from the South African Astronomical Observatory spanning the time frame from 1975 to 2013 and other datasets from 1983 to 2002, including some amateur observations. The agreement of professional results with those from amateur astronomer Sebastian Otero (2000–2013) is considered by the authors to be “excellent”, and “illustrates the quality of these amateur observations”. The visual magnitude of HR 5171 A is seen to vary between 6.10 and 7.30. It and can be viewed in the constellation of Centaurus (The Centaur). This research was presented in a paper “The yellow hypergiant HR 5171 A: Resolving a massive interacting binary in the common envelope phase”, by Chesneau et al., to appear in the journal Astronomy & Astrophysics. The team is composed of O. Chesneau (Laboratoire Lagrange, Univ. Nice Sophia-Antipolis, CNRS, Observatoire de la Côte d’Azur, Nice, France [Lagrange]), A. Meilland (Lagrange), E. Chapellier (Lagrange), F. Millour (Lagrange), A.M. Van Genderen (Leiden Observatory, Leiden, The Netherlands), Y. Nazé (Le Fonds de la Recherche Scientifique, Liège, Belgium), N. Smith (Steward Observatory, Tucson, USA), A. Spang (Lagrange), J.V. Smoker (ESO, Santiago, Chile), L. Dessart (Aix Marseille Université, CNRS, Laboratoire d’Astrophysique de Marseille, Marseille, France), S. Kanaan (Instituto de Física y Astronomía, Universidad de Valparaíso, Chile [IFA]), Ph. Bendjoya (Lagrange), M.W. Feast (South African Astronomical Observatory, South Africa [SAAO]), J.H. Groh (Geneva Observatory, Geneva, Switzerland), A. Lobel (Royal Observatory of Belgium, Brussels, Belgium), N. Nardetto (Lagrange), S. Otero (American Association of Variable Star Observers, Cambridge, MA, USA), R.D. Oudmaijer (School of Physics & Astronomy, University of Leeds, UK), A.G. Tekola (SAAO and Las Cumbres Observatory Global Telescope Network, Goleta, CA, USA), P.A. Whitelock (SAAO), C. Arcos (IFA), M. Curé (IFA) and L. Vanzi (Department of Electrical Engineering and Center of Astro Engineering, Pontiﬁcia Universidad Catolica de Chile, Santiago, Chile).